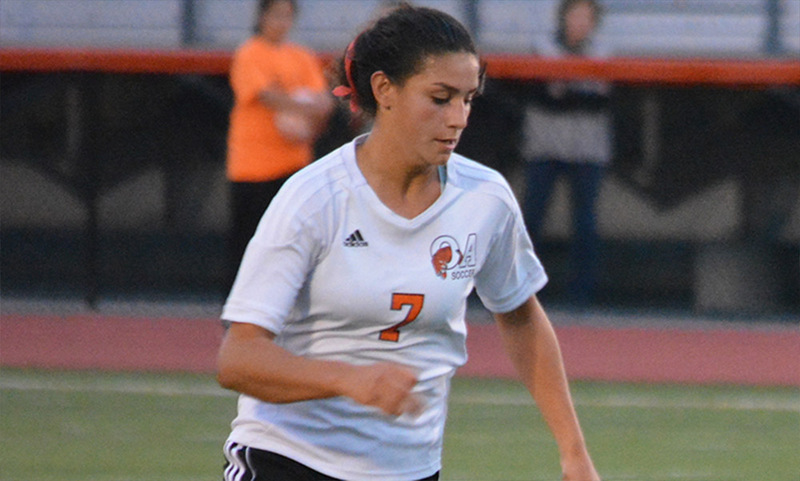 OA junior midfielder Francesca Calabraro (7) scored a pair of second half goals, as the Tigers beat Foxboro 3-0 on Wednesday. NORTH EASTON, Mass. 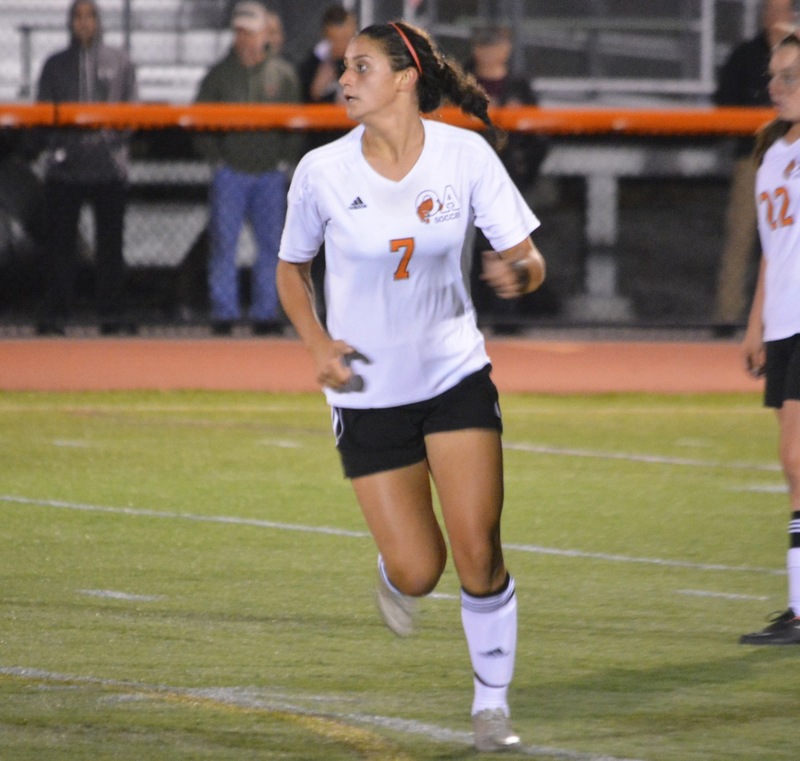 – Junior midfielder Francesca Calabraro continued her scoring surge with two goals inside of two second half minutes to break Foxboro’s resistance and lift Oliver Ames to a 3-0 win over its Davenport rival on Wednesday night at Muscato Stadium. The win open up a six-point gap between the league leading Tigers and third place Foxboro. The Tigers started the game on the front foot and pushed Foxboro back into its defending third, although the first shot on target was by Lily Sykes who had a go from 20 yards that was saved by Bethany Dunk. 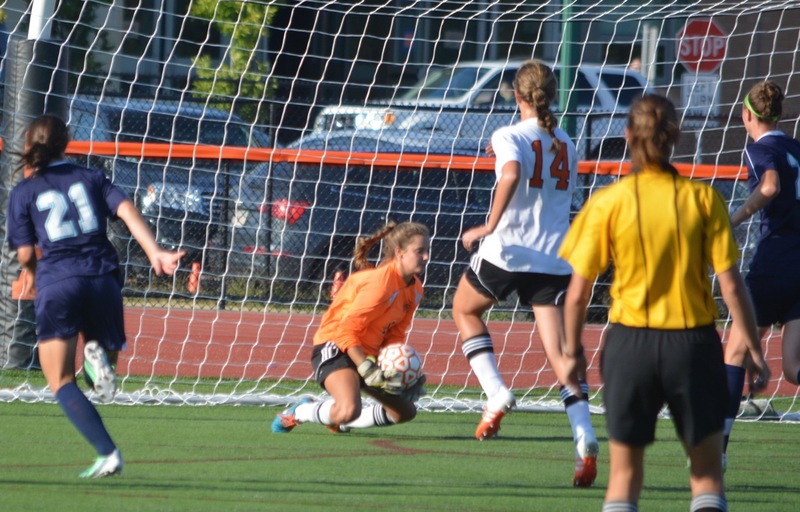 OA did not put a shot on target until the 13th minute when Delaney Benton’s 35-yard free kick was tipped over the bar at full stretch by Jalisa Allen. Three minutes later, a corner came into the box and Allen got a touch to knock it out to the 18 where freshman Sophia Cox was lurking. She had a first-time shot that was deflected and forced another good stretching save from Allen. Despite the OA pressure, the opening goal remained elusive. In the span of three minutes, Lauren Wright just missed the far post when played down the channel, Julia Roy had a shot from 20 yards land just outside the post with Allen stranded, and Calabraro rushed a shot from seven yards out after Jacqueline Mills worked space on the right and cut it back to her. In the final two minutes of the first half, the Tigers created one more good look but Allen, who made seven of her 11 saves in the opening 40 minutes, was equal to the shot from Erin Fitzgerald. 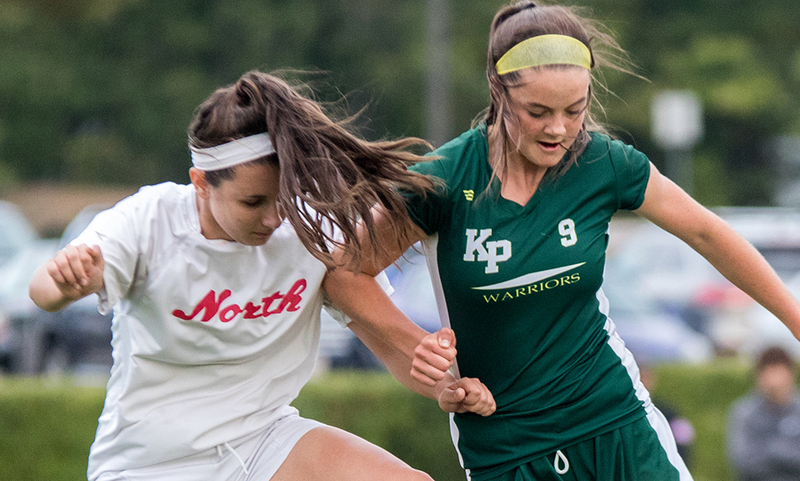 Sykes had created a couple of shots for Foxboro in the first half and forced Dunk into three saves, but the Warriors had struggled to create clear-cut chances. That changed in the opening 10 minutes of the second half. Hailey Maling had a left-footed shot that went over the bar and Carolyn Will tested new OA keeper Regan Benton with a fiercely struck free kick that was just tipped over the bar. Five minutes later, Will had another go and the Warriors bench erupted thinking the senior had broken the deadlock but the ball had stuck the upright and landed behind the net. Sellmayer made a switch and moved Calabraro back into the midfield and moved Kiana Lozzi up top as the striker. She got a chance in the 48th minute, but again the shot went wide when clear through on goa. Three minutes later, Roy got into the box and had a penalty appeal waved away before Benton ran onto the loose ball and forced Allen into a near post save. The game remained scoreless until the 56th minute when a corner kick was played to the near post and Allen made a terrific reaction save on a header, but the ball bounced around and eventually found its way to Calabraro about three yards from an empty net and she nodded the Tigers in front. Only a minute later and she had her second. Freshman defender Zoe Chazan found herself up field on the right and put in a perfect cross to the back post to find an unmarked Calabraro and she made no mistake. One of the main weapons throughout the game was the Tigers’ speedy wingers. Mills and Wright started and were spelled by Sam Bamford and Dana Lowney to allow OA to keep the pressure on and give an outlet for when Foxboro pushed forward. The ability to sub in fresh bodies has been a key for Sellmayer this season and the difference between the squads was exacerbated by the injuries that Foxboro was dealing with. “When someone asks about playing four games this week, I feel like we can do that because we go deeper,” said Sellmayer. With two minutes remaining, OA wrapped up the victory. Lozzi ran at the Warriors back line and was able to dance through on goal before calmly slotting her shot past Allen and make it 3-0. Oliver Ames (9-1-2, 8-1-2) will travel to Stoughton on Friday and play Brockton on Saturday morning. Foxboro (6-6-0, 6-5-0) will travel to second place Canton on Friday. NORTH EASTON, Mass. 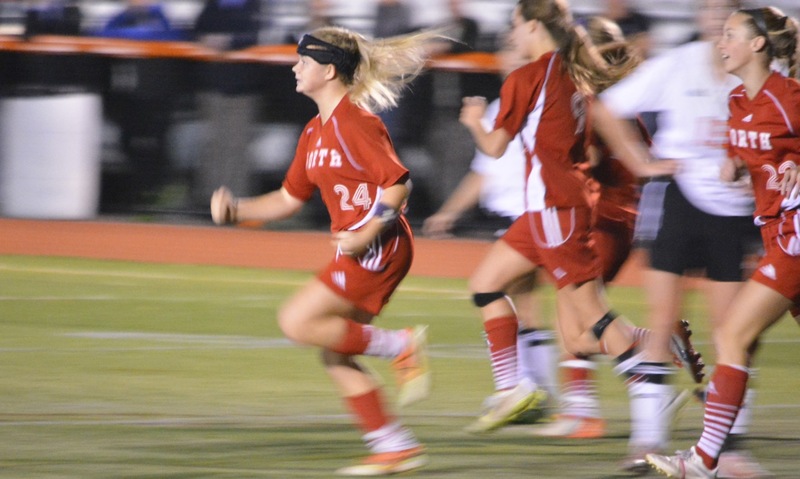 – Last year, when Franklin and Oliver Ames met in the first game of the girls’ soccer season, the Panthers dominated with a number of scoring chances that weren’t put away. In the end, keeper Dani Lonati saved the Panthers from those wasted chances by stopping a late penalty kick and earning a point. This year, the roles were reversed in the second half at Muscato Stadium. Oliver Ames dominated the ball in the second half, pushing forward, and controlling the center of the pitch, but struggled to put away the chances that it created. In the dying seconds, sophomore goalie Regan Benton made her third huge save of the half, diving out at the feet of Meg Adams, to stop a breakaway and ensure the battle of reigning league champions finished 0-0. The first half was a midfield battle with neither team able to create much in the way of consistent attack. The game was not helped by the temperatures soaring into the 90s, which felt even hotter on the sun-drenched turf. Both teams utilized their benches frequently to make sure the players would not wear down. Franklin had two chances, a Megan Georges shot and a Victoria Stowell free kick, in the opening 20 minutes that forced Benton into saves, although neither was particularly difficult. Kiana Lozzi nearly broke the game open in the 26th minute with s strong run at the heart of the Franklin defense but her shot from 20 yards out would not curl enough to sneak into the corner of the net. The best chance of the first half fell to Franklin senior Alexis Stowell in the 37th minute. Adams won a header towards the edge of the box and Bailey Knous hustled to steal it from the defender and cut it back to Stowell but her first-time shot from the edge of the six-yard box was saved at the near post by Benton. The second half was more one-sided with OA imposing its style on the game. The Tigers are a strong, physical squad and like the ball in the air where midfielder Francesca Calabraro controlled the game. Fourteen minutes into the second half, the game suddenly broke into life with a through ball flicked into the path of Lozzi by Julia Roy forced Lonati off her line quickly to save at the forward’s feet. Just seconds later, Franklin had a chance when Alexis Stowell finally snuck in behind the left back and was free on goal only to be denied by Benton again at the near post. In the 64th minute, Benton was again forced into action when Victoria Stowell found space on the edge of the box and fired a shot that was tipped over the bar. On the ensuing corner, OA broke quickly with junior winger Lauren Wright being played into space down the right and raced the full half of the field only to place her shot inches wide of the post. A couple minutes later OA again worked space on the right side of the box with Lozzi who turned and cut it back to Calabraro, but she didn’t get full contact on her shot and hit it right at Lonati. As the game started to wind down, the young Panthers started to come into the game and move the ball from side to side, probing the defense. With four minutes left, Knous had a chance but pulled it just wide and then with the clock stopped at 2:00 Adams suddenly burst onto a through ball in the box. Trailed by two defenders, Adams stretched to get a shot off but Benton was quick off her line, made herself big, and smothered the chance. There was a big collision and Adams was left punching the turf in frustration that he had not been able to find the late winner. “When it comes down to it, their keeper came up big for them or it could’ve been a loss,” said Geysen. Franklin will host Foxboro on Friday at Pisini Field, while Oliver Ames will travel to Taunton on Saturday morning.